Anti-Encroachment Force Board of Revenue Department 2019 is providing vacant posts for candidates who are interested. Interested candidates must look over the eligibility criteria and submit their application forms before the due date after which no candidate will be able to submit their forms. The application form download procedure is mentioned below along with important instructions for you to follow. The applicants already in Government service shall apply through their respective Departments or proper channels. Moreover, the candidates who have already applied must apply with a fresh application form. Candidates who fail to abide by the terms and conditions will not be allowed to sit in the test and the interview.The number of vacancies may increase or decrease concerning the number of eligible and sound applications obtained by the Anti-Encroachment Force Board of Revenue Department 2019. 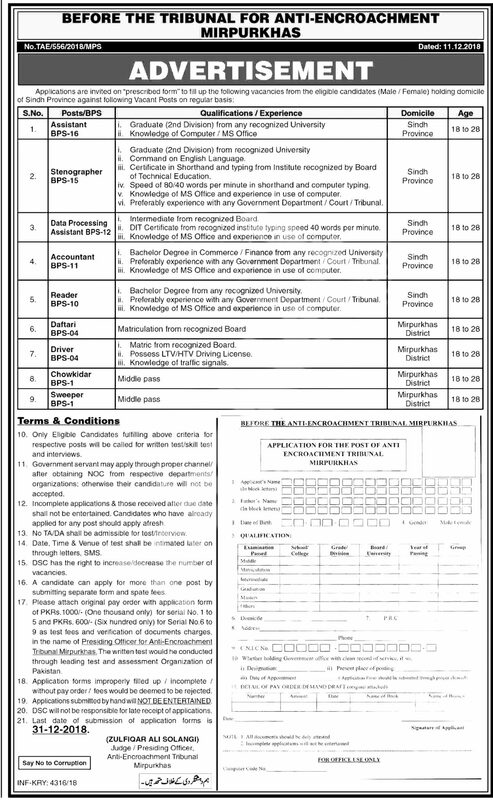 Applicants are invited from suitable candidates having domicile of Sindh province for appointments against the respective vacancies that are available by the Anti-Encroachment Force Board of Revenue Department 2019.